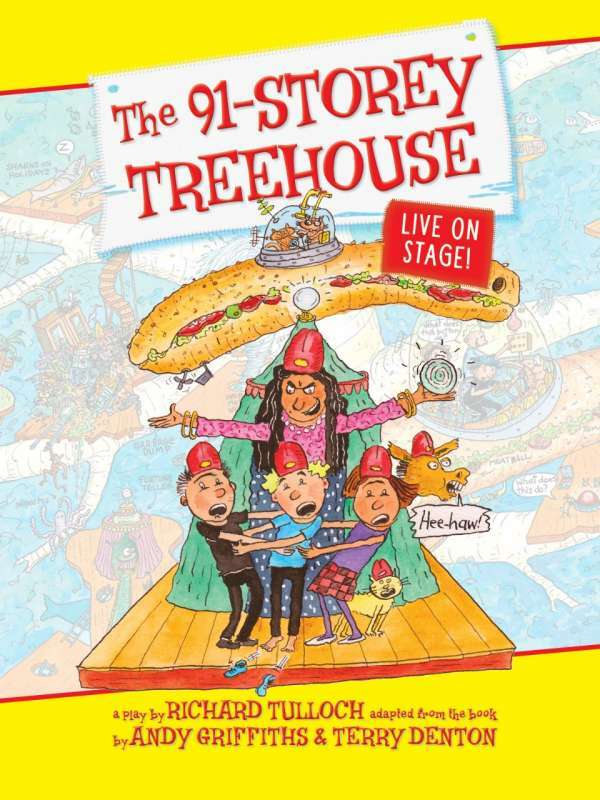 THE 91 STOREY TREEHOUSE by Andy Griffiths and Terry Denton. Adapted for the stage by Richard Tulloch. Artistic Director Julian Louis. Director Liesel Bedorrek. Set and costume designer Mark Thompson. Sound designer Ross Johnston. Lighting designer Nicholas Higgins. Costume realization Matthew Aberline. 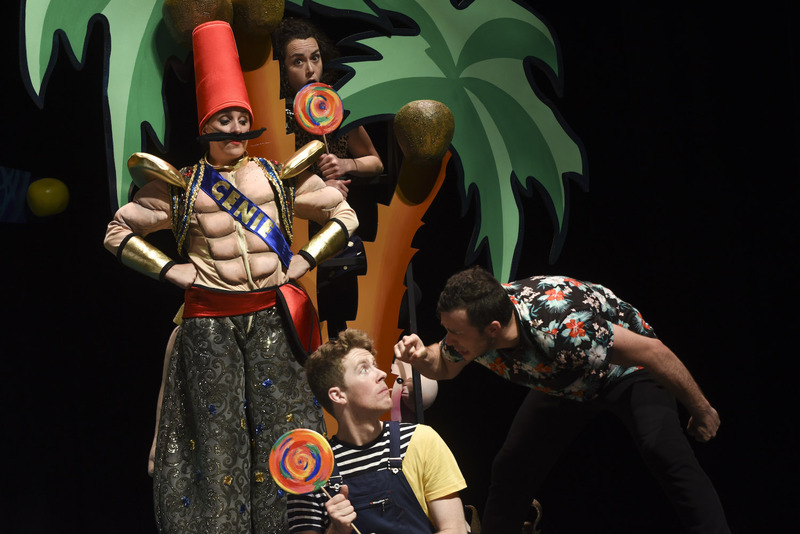 Presented by CDP Kids Production and the Canberra Theatre Centre. Canberra Theatre. February 1 and 2 2019. Andy Griffiths and Terry Denton’s treehouses just keep getting bigger and brighter and better and bouncier. Live on stage for the first time, Richard Tulloch’s fantastical, funny and furiously active adaptation of The 91 Storey Treehouse dazzles and delights the obsessive readers of a series that captures the imagination, turns the treehouse worlds of Terry and Andy and Jill upside down and round-about with madcap adventures, crazy characters and heaps of hysterically funny shenanigans. Writer Griffith and illustrator Denton have hit upon the evergreen magic key that opens the door to the child’s imagination. It is not the world of fairy tales but rather a fantastical journey into the unknown and the unexpected, a world of undersea perils, creepy crawly spiders, spinning whirlpools and terrifying tornados. And yet, in spite of its startling originality, the conventions are classical elements of children’s literature, twisted to turn familiarity into quirky surprise. Adaptor, Tulloch, a leading writer of theatre for young people, is a master of the craft. 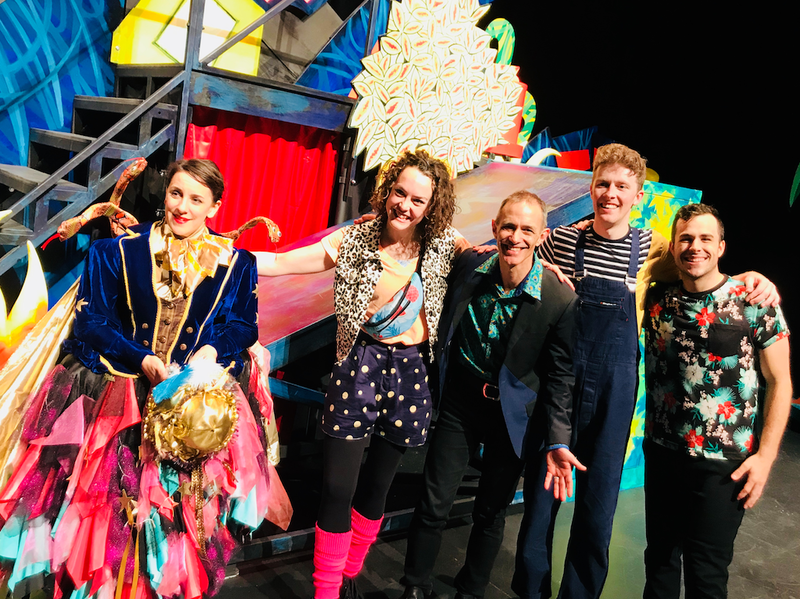 The 91 Storey Treehouse team weave a fantastical web of weird and wonderful adventures, while holding on to the eternal traditions of childhood fascination. 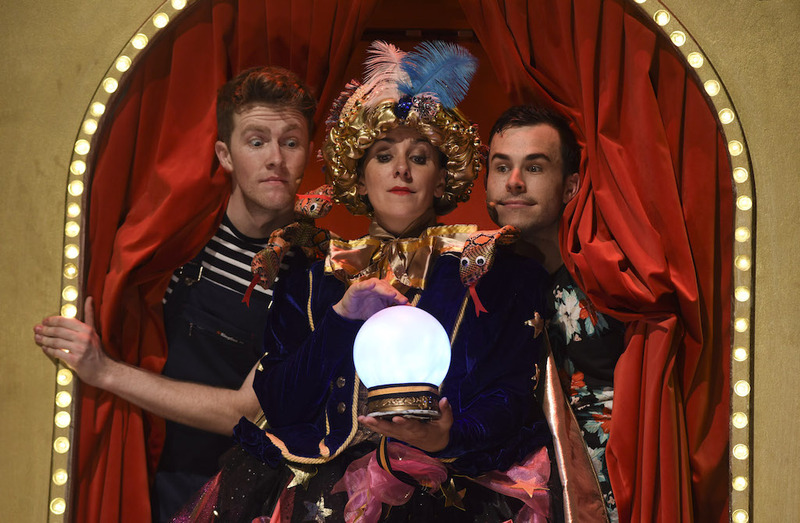 There is the villainous fortune teller of dubiously depicted Eastern European nationality, Madam Know-all (Danielle King), extravagantly and colourfully costumed by Matthew Aberline, intent on draining everybody’s brain of knowledge. There is tumbling, stumbling slapstick over, around and up and down Mark Thompson’s brilliantly conceived Treehouse set. There are puns galore and malapropisms too, mainly from the lips of the less than bright Terry (Teal Howie). Even Andy (Samuel Welsh) is none too bright when it comes to dealing with spiders or remembering names, and it takes Jill (Freya Pragt) to rescue the boys from a harmless furry huntsman. How puppet Mt. Big Nose could entrust his grandchildren to such an unlikely team of babysitters defies comprehension, but is sure to create further confusion and anyway, suspense is nail-biting high when it seems that Terry may push the dangerous red button and blow them all sky high. Of course, like any good children’s story, The 91 Storey Treehouse ends happily with a flourish of inflated, colourful branches and a bouncy finale that has every child in the audience clapping loudly and every adult remembering that a child’s world of imagination is something too good to let go. The show is advertised for 6-12 year olds, but like every top quality kids’ production, this is one for everyone who still takes joy in a child-like love of adventure, danger and silliness that still ends happily ever after. How high can a treehouse grow? Higher than the highest branch of the imagination it seems and then further still until it reaches the last leaf of the imagination and that will only be when children cease to imagine and that will never be. Be sure to climb up this CDP Kids Production’s treehouse and from the very top keep looking out for The 104 Storey Treehouse when Terry and Andy and Jill will take you to new thrilling heights.